I got an opportunity to meet Prof. Ramnarayan, an authority on change management, at the Innovation Educators’ Conference in ISB last week. 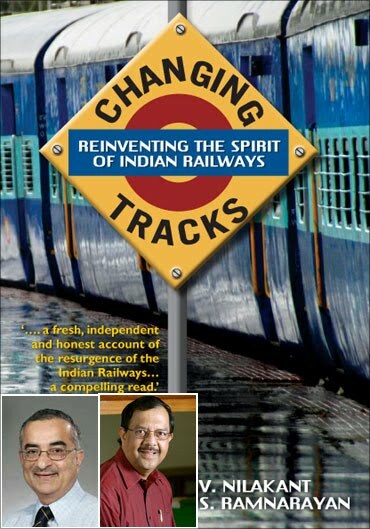 When I asked him about his favorite organizational change story from India, he modestly pointed to his book – “Changing tracks: Reinventing the spirit of Indian Railways” which he co-authored with V. Nilakant. I bought it in the ISB book store and started reading it in Kacheguda Express on the way back from Hyderabad. It is by far the best book I have read on an organizational transformation in the Indian context. After all we are talking about a 150 year old organization whose trains cover a total daily distance greater than the distance from earth to moon and back and support 1.1 million pensioners. Here is one of the fascinating innovations from the book on how Mr. Jaruhar, member (Engineering), broke a fifty year old myth on how much weight the trains can carry on Indian rail tracks. This was one of the key levers to bring the Railways back to profitability from close to bankruptcy. Soon after taking charge as Railway minister in 2004 Lalu Prasad and his partner Sudhir Kumar launched the campaign – “Heavier, faster and longer” trains. The first part of running “heavier” trains was based on the observation that the Indian Railways ran trains carrying about 4,700 tonnes while the comparable figure was 15,000 in the US, 30,000 in Brazil and 20,000 in China. In railway jargon, this was based on a parameter called axle load – the maximum weight of a train per pair of wheels allowable for given section of tracks. In 2004, the permissible axle load was 20.32 tonnes and it was unchanged since 1960s. The axle load ranged between 25 and 35 in other countries with rails comparable in quality. On 4 March 2005, three days after he took charge as member (Engineering), Jaruhar called a meeting of his directorate. He posed them the challenge, “Railway needs to carry additional 350 million tones of freight in the short term and much more than that in the long term. How do we meet this demand?” His staff responded enthusiastically and within a week ideas started flowing. A number of technical objections were raised on the proposed solutions and the consensus was that this was difficult to do. Jaruhar realized he needed to challenge the engineers in a different way. Jaruhar proposed that first they needed to investigate how the original value of (20.32 tonnes) was arrived at. Second, they needed to find if there was any permissible tolerance. How come the train becomes suddenly unsafe after the axle load goes beyond 20.32? Jaruhar knew that he was entering a forbidden territory. The laid down procedure for modifying axle load was complex and time-consuming. It involved detailed trials and studies and required the approval of independent bodies such as the Commission of Railway Safety, a non-railway body. It is no surprise the permissible axle load wasn’t modified for several decades. A turning point came when Jaruhar realized that the existing codes and provisions allowed him to conduct experiments. He decided to experiment with running higher axle loads on trains. In consultation with traffic department, Jaruhar selected routes which had mainly freight traffic and very little passenger traffic. He increased the axle load on freight trains running on these routes. He engaged independent agencies such as Structural Engineering Research Centre, IIT Chennai and Railways’ own Research, Design and Standards Organization (RDSO) in Lucknow to measure the forces and stresses on rails. The pilot began on 7 May 2005 and ran till August that year. The train load was increased from 4,700 tonnes to 5,400 tonnes. Extensive data was collected both by his own teams and the neutral independent agencies. Jaruhar organized a seminar in Delhi in August 2005. Each zonal railway that participated in the pilot project made presentations based on the data they had collected on rail tracks, bridges, locomotives and wagons. Two other members of the Railway Board also attended the seminar. There were no adverse reports. Additional questions had to be answered before moving ahead. Would it increase the frequency of renewal of rail tracks? By how much? At what cost? Would it result in increased rail fractures? What if something goes wrong? Subsequently Jaruhar’s experiments addressed these issues systematically and demonstrated how axle load can be increased safely resulting in significant revenue growth. Lalu Prasad acknowledged the contribution this project in his 2006 budget speech. For anyone serious about leading organizational change “Changing tracks” is a must read case study. The situation looks to have been tackled in a systematic and organized manner.